Parivahan Vibhag Ambala is ready to hire the applicants for the 20 available seats of Diesel Mechanic, Tier man, Stenographer Jobs as per the Parivahan Vibhag Ambala Recruitment 2017 advertisement published on department web portal. Job seekers who have required eligibility may apply through Online Mode after reading all the details of Parivahan Vibhag Ambala Recruitment 2017 through this section.Candidates who meet the eligibility criteria and interested to apply they can submit their application form before the last date that is 10th April 2017. Education Needed : Candidates who are willing to apply for Parivahan Vibhag Ambala jobs must read official notification for post wise qualification. The Age of the applying candidate will be decided by the organization according to the organizational norms. Reserved category applicants will get the age relaxation as per Parivahan Vibhag Ambala norms. Closing Date For Apply Online : 10-04-2017. Click Here For Parivahan Vibhag Ambala Official Notification Link. Department of Fisheries Andhra Pradesh is ready to hire the applicants for the 11 available seats of Multi Purpose Assistant Jobs as per the Dept of Fisheries AP Recruitment 2017 advertisement published on department web portal. Job seekers who have required eligibility may apply through Offline Mode after reading all the details of Dept of Fisheries AP Recruitment 2017 through this section.You are needed to send the application form in the appropriate format at the below address till or before 3rd April 2017. Education Needed : Candidates who are willing to apply for Dept of Fisheries AP jobs must posses B.Sc. / B.F.Sc. / Graduation Degree from any recognized board or institution. The candidates who wish to apply for the available vacancy should not be more than 40 Years. Reserved category applicants will get the age relaxation as per Dept of Fisheries AP norms. Last Date for Receiving Hard Copy of Application Form Is : 03-04-2017. Click Here For Dept of Fisheries AP Official Notification Link. District Education Office Sundargarh is ready to hire the applicants for the 07 available seats of Clerk Jobs as per the District Education Office Sundargarh Recruitment 2017 advertisement published on department web portal. Job seekers who have required eligibility may apply through Offline Mode after reading all the details of District Education Office Sundargarh Recruitment 2017 through this section.You are needed to send the application form in the appropriate format at the below address till or before 10th April 2017. Education Needed : Candidates who are willing to apply for District Education Office Sundargarh jobs must posses Graduation Degree from any recognized board or institution. Those aspirants who are belonging to All Category & interested to apply for above posts they need to be paid Processing fee of 200/-. The candidates who wish to apply for the available vacancy should be existing between 21 - 32 Years As On 27-03-2017. Reserved category applicants will get the age relaxation as per District Education Office Sundargarh norms. Emoluments given to Employee: Contenders who will be appointed successfully for District Education Office Sundargarh Vacancy, they get the salary pay band of Rs. 7,100/-. as per organization norms. Closing Date for Forwarding Filled Application Forms : 10-04-2017. Click Here For District Education Office Sundargarh Official Notification Link. Doon University is ready to hire the applicants for the 01 available seats of Assistant Professor Jobs as per the Doon University Recruitment 2017 advertisement published on department web portal. Job seekers who have required eligibility may apply after reading all the details of Doon University Recruitment 2017 through this section.Candidates who meet the eligibility criteria and interested to apply they can send their soft copy of application form through Email before the last date that is 8th April 2017. Education Needed : Candidates who are willing to apply for Doon University jobs must posses Post Graduation Degree from any recognized board or institution. Reserved category applicants will get the age relaxation as per Doon University norms. Emoluments given to Employee: Contenders who will be appointed successfully for Doon University Vacancy, they get the salary pay band of Rs. 25,000/- as per organization norms. Closing Date to Send Copy of Application Form Is : 08-04-2017. Click Here For Doon University Official Notification Link. District Court Gurugram is ready to hire the applicants for the 17 available seats of Stenographer, Peon Jobs as per the District Court Gurugram Recruitment 2017 advertisement published on department web portal. Job seekers who have required eligibility may apply through Offline Mode after reading all the details of District Court Gurugram Recruitment 2017 through this section.You are needed to send the application form in the appropriate format at the below address till or before 11th April 2017. Education Needed : Candidates who are willing to apply for District Court Gurugram jobs must posses 8th / Graduation Degree from any recognized board or institution. The candidates who wish to apply for the available vacancy should be existing between 18 - 42 Years As On 01-01-2017. Reserved category applicants will get the age relaxation as per District Court Gurugram norms. Emoluments given to Employee: Contenders who will be appointed successfully for District Court Gurugram Vacancy, they get the salary pay band of Rs. 4,440 - 7,440/- (Post 2) plus Grade Pay of Rs. 1300/- (Post 2) as per organization norms. Selection of the job hunters will be done on the basis of their performance in the Written Exam, Personal Interview/ Oral Test conducted by the selection committee. Deadline to Submit Hard Copy of Application Form Is : 11-04-2017. Click Here For District Court Gurugram Official Notification Link. Tripura Forest Department is ready to hire the applicants for the 36 available seats of Forest Guard Jobs as per the Tripura Forest Department Recruitment 2017 advertisement published on department web portal. Job seekers who have required eligibility may apply through Offline Mode after reading all the details of Tripura Forest Department Recruitment 2017 through this section.You are needed to send the application form in the appropriate format at the below address till or before 10th April 2017. Education Needed : Candidates who are willing to apply for Tripura Forest Department jobs must posses 10th from any recognized board or institution. The candidates who wish to apply for the available vacancy should be existing between 18 - 40 Years As On 01-03-2017. Reserved category applicants will get the age relaxation as per Tripura Forest Department norms. Emoluments given to Employee: Contenders who will be appointed successfully for Tripura Forest Department Vacancy, they get the salary pay band of Rs. 5,700 - 24,000/- plus 2100/- Grade Pay as per organization norms. Selection of the job hunters will be done on the basis of their performance in the Physical Measurement, Personal Interview conducted by the selection committee. Last Date for Receiving Hard Copy of Application Form Is : 10-04-2017. Click Here For Tripura Forest Department Official Notification Link. Indian Institute of Tropical Meteorology is ready to hire the applicants for the 22 available seats of Research Associates, Fellows Jobs as per the IITM Recruitment 2017 advertisement published on department web portal. Job seekers who have required eligibility may apply through Online Mode after reading all the details of IITM Recruitment 2017 through this section.Candidates who meet the eligibility criteria and interested to apply they can submit their application form before the last date that is 30th April 2017. Education Needed : Candidates who are willing to apply for IITM jobs must posses Engineering Degree / Post Graduation Degree from any recognized board or institution. The candidates who wish to apply for the available vacancy should not be more than 35 Years (Post 1), 28 Years (Post 2) As On 30-04-2017. Reserved category applicants will get the age relaxation as per IITM norms. Emoluments given to Employee: Contenders who will be appointed successfully for IITM Vacancy, they get the salary pay band of Rs. 36,000/- (Post 1) Rs. 25,000/- (Post 2) as per organization norms. Dead Line To Submit Online Application Is : 30-04-2017. Click Here For IITM Official Notification Link. Indian Institute of Tropical Meteorology is ready to hire the applicants for the 01 available seats of Junior Engineer Jobs as per the IITM Recruitment 2017 advertisement published on department web portal. Job seekers who have required eligibility may apply after reading all the details of IITM Recruitment 2017 through this section.Candidates who have decided to build their career in this organization they can attend Walkin Interview which are going to be held On 30th March 2017. Education Needed : Candidates who are willing to apply for IITM jobs must posses Engineering Degree from any recognized board or institution. The candidates who wish to apply for the available vacancy should not be more than 28 Years As On 01-03-2017. Emoluments given to Employee: Contenders who will be appointed successfully for IITM Vacancy, they get the salary pay band of Rs. 22,000/-. as per organization norms. Date for the Walk In Interview : 30-03-2017. Lakshmi Vilas Bank is ready to hire the applicants for the Various available seats of Probationary Officers Jobs as per the LVB Recruitment 2017 advertisement published on department web portal. Job seekers who have required eligibility may apply through Online Mode after reading all the details of LVB Recruitment 2017 through this section.Candidates who meet the eligibility criteria and interested to apply they can submit their application form before the last date that is 17th April 2017. Education Needed : Candidates who are willing to apply for LVB jobs must posses Diploma / Graduation Degree from any recognized board or institution. Those aspirants who are belonging to All Category & interested to apply for above posts they need to be paid Processing fee of 650/-. The candidates who wish to apply for the available vacancy should be existing between 20 - 30 Years As On 01-03-2017. Reserved category applicants will get the age relaxation as per LVB norms. Selection of the job hunters will be done on the basis of their performance in the Online Examination, Group Discussion and Personal Interview conducted by the selection committee. Online Registration of Application Form Is Starts From : 29-03-2017. Dead Line For Apply Online : 17-04-2017. Click Here For LVB Official Notification Link. Haryana State Pollution Control Board is ready to hire the applicants for the 53 available seats of Clerk, Steno Typist, Peon Jobs as per the HSPCB Recruitment 2017 advertisement published on department web portal. Job seekers who have required eligibility may apply through Offline Mode after reading all the details of HSPCB Recruitment 2017 through this section.You are needed to send the application form in the appropriate format at the below address till or before 18th April 2017. Education Needed : Candidates who are willing to apply for HSPCB jobs must posses 8th / 10th / Graduation Degree from any recognized board or institution. The candidates who wish to apply for the available vacancy should be existing between 17 - 42 Years. Reserved category applicants will get the age relaxation as per HSPCB norms. Closing Date for Forwarding Filled Application Forms : 18-04-2017. Kirori Mal College is ready to hire the applicants for the 15 available seats of Assistant, MTS Library, Administrative Officer Jobs as per the Kirori Mal College Recruitment 2017 advertisement published on department web portal. Job seekers who have required eligibility may apply through Offline Mode after reading all the details of Kirori Mal College Recruitment 2017 through this section.You are needed to send the application form in the appropriate format at the below address till or before 11th April 2017. Education Needed : Candidates who are willing to apply for Kirori Mal College jobs must posses 10th / 12th / Engineering Degree / Post Graduation Degree / Graduation Degree from any recognized board or institution. Those aspirants who are belonging to General/ OBC Category & interested to apply for above posts they need to be paid Processing fee of 250/-. Job hunters belonging to SC/ ST/ PWD (Persons with Disability)/ Women Category are exempted from such payment of processing fee. The candidates who wish to apply for the available vacancy should not be more than 35 Years (Post 1-3,5,8), 30 Years (Post 4,6), 27 Years (Post 7,9,10). Reserved category applicants will get the age relaxation as per Kirori Mal College norms. Emoluments given to Employee: Contenders who will be appointed successfully for Kirori Mal College Vacancy, they get the salary pay band of Rs. 15,600 - 39,100/- plus 5400/- Grade Pay (Post 1), Rs. 9300 - 34,800/- plus 4200/- Grade Pay (Post 2,5,8), Rs. 5200 – 20,200/- plus 2800/2000/1800/- Grade Pay (Post 3,4,6,7,9,10) as per organization norms. Deadline to Submit the Application Is : 11-04-2017. Click Here For Kirori Mal College Official Notification Link. Kendriya Vidyalaya I.I.T. Kanpur is ready to hire the applicants for the Various available seats of Teacher, Doctor, Nurse Jobs as per the Kendriya Vidyalaya I.I.T. Kanpur Recruitment 2017 advertisement published on department web portal. Job seekers who have required eligibility may apply after reading all the details of Kendriya Vidyalaya I.I.T. Kanpur Recruitment 2017 through this section.Candidates who have decided to build their career in this organization they can attend Walkin Interview which are going to be held On 29th March & 30th March 2017. Education Needed : Candidates who are willing to apply for Kendriya Vidyalaya I.I.T. Kanpur jobs must read official notification for post wise qualification. Reserved category applicants will get the age relaxation as per Kendriya Vidyalaya I.I.T. Kanpur norms. Last Date to Attend Interview : 29-03-2017 & 30-03-2017. Date for Written Examination : 30-03-2017. (PGT (Computer Science) and Computer Instructor). Click Here For Kendriya Vidyalaya I.I.T. Kanpur Official Notification Link. Shaheed Bhagat Singh College is ready to hire the applicants for the 19 available seats of Assistant, Attendant Jobs as per the SBSC Recruitment 2017 advertisement published on department web portal. Job seekers who have required eligibility may apply through Offline Mode after reading all the details of SBSC Recruitment 2017 through this section.You are needed to send the application form in the appropriate format at the below address till or before 21st April 2017. Education Needed : Candidates who are willing to apply for SBSC jobs must posses 10th / 12th / Graduation Degree / Post Graduation Degree from any recognized board or institution. Those aspirants who are belonging to General/ OBC Category & interested to apply for above posts they need to be paid Processing fee of 200/-. Job hunters belonging to SC/ ST Category & interested to apply for above posts they need to be paid Processing fee of 100/-. The candidates who wish to apply for the available vacancy should not be more than 35 Years (Post 1-3), 30 Years (Post 4,6,9), 27 Years (Post 5,7-8). Reserved category applicants will get the age relaxation as per SBSC norms. Emoluments given to Employee: Contenders who will be appointed successfully for SBSC Vacancy, they get the salary pay band of Rs. 9,300 - 34,800/- (Post 1,3), Rs. 5,200 - 20,200/- (Post 2,4-9) plus Grade Pay of Rs. 4200/- (Post 1,3), Rs. 2800/- (Post 2), Rs. 2400/- (Post 4), Rs. 1900/- (Post ), Rs. 2000/- (Post 6), Rs. 1800/- (Post 7-9) as per organization norms. Last Date of Receipt of Applications : 21-04-2017. Click Here For SBSC Official Notification Link. Directorate of Technical Education Madhya Pradesh is ready to hire the applicants for the 03 available seats of Steno Typist, Assistant, Peon Jobs as per the Directorate of Technical Education MP Recruitment 2017 advertisement published on department web portal. Job seekers who have required eligibility may apply after reading all the details of Directorate of Technical Education MP Recruitment 2017 through this section.Candidates who have decided to build their career in this organization they can attend Walkin Interview which are going to be held On 2nd MAY 2017. Education Needed : Candidates who are willing to apply for Directorate of Technical Education MP jobs must posses 8th / 12th / Diploma from any recognized board or institution. Reserved category applicants will get the age relaxation as per Directorate of Technical Education MP norms. Emoluments given to Employee: Contenders who will be appointed successfully for Directorate of Technical Education MP Vacancy, they get the salary pay band of Rs. 5,200 - 20,200/- (Post 1-2), Rs. 4,440 - 7,440/- (Post 3) plus Grade Pay of Rs. 1900/- (Post 1-2), Rs. 1300/- (Post 3) as per organization norms. Date of Interview : 02-05-2017. Click Here For Directorate of Technical Education MP Official Notification Link. Disabled Welfare Department Nalgonda is ready to hire the applicants for the 17 available seats of Typist, Technical Officer, Trasser Jobs as per the Disabled Welfare Department Nalgonda Recruitment 2017 advertisement published on department web portal. Job seekers who have required eligibility may apply through Offline Mode after reading all the details of Disabled Welfare Department Nalgonda Recruitment 2017 through this section.You are needed to send the application form in the appropriate format at the below address till or before With In 15 Day's. Education Needed : Candidates who are willing to apply for Disabled Welfare Department Nalgonda jobs must posses 5th / 7th / 10th / 12th / Graduation Degree from any recognized board or institution. The candidates who wish to apply for the available vacancy should be existing between 18 - 54 Years As On 01-01-2017. Reserved category applicants will get the age relaxation as per Disabled Welfare Department Nalgonda norms. Last Date for Receiving Hard Copy of Application Form Is : With In 15 Day's. Click Here For Disabled Welfare Department Nalgonda Official Notification Link. Salem District Court is ready to hire the applicants for the 71 available seats of Bailiff, Clerk, Sweeper Jobs as per the Salem District Court Recruitment 2017 advertisement published on department web portal. Job seekers who have required eligibility may apply through Offline Mode after reading all the details of Salem District Court Recruitment 2017 through this section.You are needed to send the application form in the appropriate format at the below address till or before 12th April 2017. Education Needed : Candidates who are willing to apply for Salem District Court jobs must posses 8th / 10th / 12th from any recognized board or institution. The candidates who wish to apply for the available vacancy should be existing between 18 - 30 Years As On 01-01-2017. Reserved category applicants will get the age relaxation as per Salem District Court norms. Emoluments given to Employee: Contenders who will be appointed successfully for Salem District Court Vacancy, they get the salary pay band of Rs. 5,200 - 20,200/- plus 2400/2200/- Grade Pay (Post 1-3), Rs. 4,800 - 10,000/- plus 1300/1400/- Grade Pay (Post 4-10) as per organization norms. Application Has To Be Sent Latest By : 12-04-2017. Click Here For Salem District Court Official Notification Link. Karnataka Industrial Area Development Board is ready to hire the applicants for the Various available seats of Technical Advisor, Finance Officer, Executive Assistant Jobs as per the KIADB Recruitment 2017 advertisement published on department web portal. Job seekers who have required eligibility may apply after reading all the details of KIADB Recruitment 2017 through this section.Candidates who meet the eligibility criteria and interested to apply they can send their soft copy of application form through Email before the last date that is 3rd April 2017. Education Needed : Candidates who are willing to apply for KIADB jobs must posses Graduation Degree / Engineering Degree from any recognized board or institution. Reserved category applicants will get the age relaxation as per KIADB norms. Closing Date to Send Copy of Application Form Is : 03-04-2017. Click Here For KIADB Official Notification Link. Chief Medical Officer of Health Paschim Medinipur is ready to hire the applicants for the 06 available seats of Laboratory Technician Jobs as per the CMOH Paschim Medinipur Recruitment 2017 advertisement published on department web portal. Job seekers who have required eligibility may apply through Offline Mode after reading all the details of CMOH Paschim Medinipur Recruitment 2017 through this section.You are needed to send the application form in the appropriate format at the below address till or before 6th April 2017. Education Needed : Candidates who are willing to apply for CMOH Paschim Medinipur jobs must posses 12th / Diploma from any recognized board or institution. Reserved category applicants will get the age relaxation as per CMOH Paschim Medinipur norms. Emoluments given to Employee: Contenders who will be appointed successfully for CMOH Paschim Medinipur Vacancy, they get the salary pay band of Rs. 9,380/-. as per organization norms. Selection of the job hunters will be done on the basis of their performance in the Test, Computer Test conducted by the selection committee. Deadline to Submit Hard Copy of Application Form Is : 06-04-2017. Click Here For CMOH Paschim Medinipur Official Notification Link. Public Work Department is ready to hire the applicants for the 03 available seats of Consulting Architect, Structural Engineer Jobs as per the MPPWD Recruitment 2017 advertisement published on department web portal. Job seekers who have required eligibility may apply through Offline Mode after reading all the details of MPPWD Recruitment 2017 through this section.You are needed to send the application form in the appropriate format at the below address till or before 17th April 2017. Education Needed : Candidates who are willing to apply for MPPWD jobs must posses Graduation Degree / Engineering Degree / Post Graduation Degree from any recognized board or institution. The candidates who wish to apply for the available vacancy should be existing between 25 - 60 Years (Post 1,3), 30 - 60 Years (Post 4). Reserved category applicants will get the age relaxation as per MPPWD norms. Emoluments given to Employee: Contenders who will be appointed successfully for MPPWD Vacancy, they get the salary pay band of Rs. 50,000/- (Post 1,3), Rs. 60,000/- (Post 2) as per organization norms. Closing Date of Offline Submission of Applications Is : 17-04-2017. Click Here For MPPWD Official Notification Link. Janki Devi Memorial College is ready to hire the applicants for the 14 available seats of Assistant, Attendant Jobs as per the JDMC Recruitment 2017 advertisement published on department web portal. Job seekers who have required eligibility may apply through Offline Mode after reading all the details of JDMC Recruitment 2017 through this section.You are needed to send the application form in the appropriate format at the below address till or before 15th April 2017. Education Needed : Candidates who are willing to apply for JDMC jobs must posses 10th / 12th / Diploma / Graduation Degree / Engineering Degree / Post Graduation Degree from any recognized board or institution. The candidates who wish to apply for the available vacancy should not be more than 30 Years (Post 1,5) 35 Years (Post 2-4) 27 Years (Post 6-8). Reserved category applicants will get the age relaxation as per JDMC norms. Emoluments given to Employee: Contenders who will be appointed successfully for JDMC Vacancy, they get the salary pay band of Rs. 9300 - 34,800/- plus 4200/- Grade Pay (Post 1-3), Rs. 5200 - 20,200/- plus 2800/- Grade Pay (Post 4-8) as per organization norms. Selection of the job hunters will be done on the basis of their performance in the Written Exam / Practical Test / Skill Test conducted by the selection committee. Closing Date for Receiving Hard Copy of Application Form Is : 15-04-2017. Click Here For JDMC Official Notification Link 1. Click Here For JDMC Official Notification Link 2. Click Here For JDMC Official Notification Link 3. 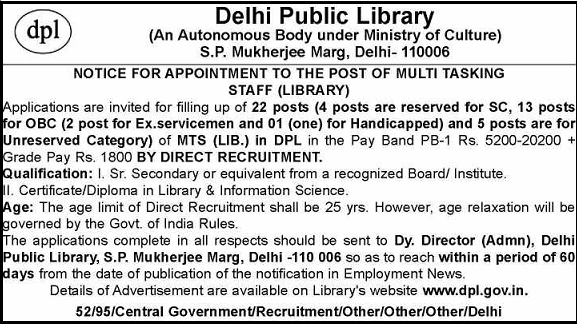 Delhi Public Library is ready to hire the applicants for the 22 available seats of Multi Tasking Staff Jobs as per the DPL Recruitment 2017 advertisement published on department web portal. Job seekers who have required eligibility may apply through Offline Mode after reading all the details of DPL Recruitment 2017 through this section.You are needed to send the application form in the appropriate format at the below address till or before 23rd May 2017. Education Needed : Candidates who are willing to apply for DPL jobs must posses 12th / Diploma from any recognized board or institution. The candidates who wish to apply for the available vacancy should not be more than 25 Years. Reserved category applicants will get the age relaxation as per DPL norms. Emoluments given to Employee: Contenders who will be appointed successfully for DPL Vacancy, they get the salary pay band of Rs. 5,200 - 20,200/- plus 1800/- Grade Pay as per organization norms. Last Date for the Submission of Application : 23-05-2017. Department Medical Education Rajasthan is ready to hire the applicants for the 520 available seats of Professor, Demonstrator, Resident Jobs as per the DME Rajasthan Recruitment 2017 advertisement published on department web portal. Job seekers who have required eligibility may apply through Online Mode after reading all the details of DME Rajasthan Recruitment 2017 through this section.Candidates who meet the eligibility criteria and interested to apply they can submit their application form before the last date that is 6th April 2017. Education Needed : Candidates who are willing to apply for DME Rajasthan jobs must posses Graduation Degree / Post Graduation Degree from any recognized board or institution. Those aspirants who are belonging to All Category & interested to apply for above posts they need to be paid Processing fee of 2000/-. The candidates who wish to apply for the available vacancy should be existing between 18 - 70 Years. Reserved category applicants will get the age relaxation as per DME Rajasthan norms. Dead Line of Online Application Is : 06-04-2017. Click Here For DME Rajasthan Official Notification Link. Financial Intelligence Unit is ready to hire the applicants for the 15 available seats of Assistant, Clerk, Private Secretary Jobs as per the FIU Recruitment 2017 advertisement published on department web portal. Job seekers who have required eligibility may apply through Offline Mode after reading all the details of FIU Recruitment 2017 through this section.You are needed to send the application form in the appropriate format at the below address till or before 8th May 2017. Education Needed : Candidates who are willing to apply for FIU jobs must posses Graduation Degree / Post Graduation Degree from any recognized board or institution. Emoluments given to Employee: Contenders who will be appointed successfully for FIU Vacancy, they get the salary pay band of Rs. 9300 – 34,800/- With 4600/4200/- Grade Pay (Post 1-3), Rs. 5200 – 20,200/- With 2400/1900/- Grade Pay (Post 4-6) as per organisation norms. Closing Date of Offline Submission of Applications Is : 08-05-2017. Click Here For FIU Official Notification Link 1. Bhartiya Rail Bijlee Company Limited is ready to hire the applicants for the 75 available seats of Diploma Trainees Jobs as per the BRBCL Recruitment 2017 advertisement published on department web portal. Job seekers who have required eligibility may apply through Online Mode after reading all the details of BRBCL Recruitment 2017 through this section.Candidates who meet the eligibility criteria and interested to apply they can submit their application form before the last date that is 26th April 2017. 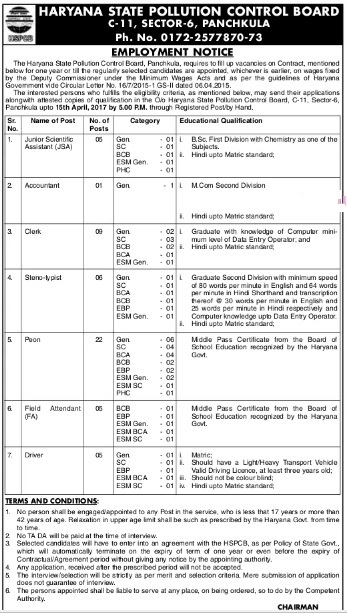 Education Needed : Candidates who are willing to apply for BRBCL jobs must posses Diploma (Mechanical / Civil / Computer and Instrumentation / Electrical / Electronic Engineering) from any recognized board or institution. Job hunters belonging to SC/ST/PWD/XSM Category are exempted from such payment of processing fee. Reserved category applicants will get the age relaxation as per BRBCL norms. Emoluments given to Employee: Contenders who will be appointed successfully for BRBCL Vacancy, they get the salary pay band of Rs. 15500/- (During Training), Rs. 15500-3%-34500/- (on completion of Training) as per organization norms. Selection of the job hunters will be done on the basis of their performance in the Written Exam / Skill Test conducted by the selection committee. Online Registration Would Be Open From : 27-03-2017. Last Date To Apply Online Is : 26-04-2017. Downloading of Admit Card Would Be Open From : 05-05-2017. Date for Written Examination : 28-05-2017. Click Here For BRBCL Official Notification Link. Office of the Superintendent Simdega is ready to hire the applicants for the 800 available seats of Assistant Police Jobs as per the Office of the Superintendent Simdega Recruitment 2017 advertisement published on department web portal. Job seekers who have required eligibility may apply through Offline Mode after reading all the details of Office of the Superintendent Simdega Recruitment 2017 through this section.You are needed to send the application form in the appropriate format at the below address till or before 5th April 2017. Education Needed : Candidates who are willing to apply for Office of the Superintendent Simdega jobs must posses 10th from any recognized board or institution. Reserved category applicants will get the age relaxation as per Office of the Superintendent Simdega norms. Emoluments given to Employee: Contenders who will be appointed successfully for Office of the Superintendent Simdega Vacancy, they get the salary pay band of Rs. 10,000/- as per organization norms. Selection of the job hunters will be done on the basis of their performance in the Written Exam, Physical Efficiency Test, Medical Test conducted by the selection committee. Deadline to Submit the Application Is : 05-04-2017. Click Here For Office of the Superintendent Simdega Official Notification Link. Haryana Seeds Development Corporation Limited is ready to hire the applicants for the 106 available seats of Salesman, Clerk, Steno-Typist Jobs as per the Haryana Seeds Development Corporation Limited Recruitment 2017 advertisement published on department web portal. Job seekers who have required eligibility may apply through Offline Mode after reading all the details of Haryana Seeds Development Corporation Limited Recruitment 2017 through this section.You are needed to send the application form in the appropriate format at the below address till or before 31st March 2017. Education Needed : Candidates who are willing to apply for Haryana Seeds Development Corporation Limited jobs must posses 10th / 12th / ITI / Graduation Degree from any recognized board or institution. Job hunters belonging to SC/ ST Category & interested to apply for above posts they need to be paid Processing fee of 50/-. Reserved category applicants will get the age relaxation as per Haryana Seeds Development Corporation Limited norms. Emoluments given to Employee: Contenders who will be appointed successfully for Haryana Seeds Development Corporation Limited Vacancy, they get the salary pay band of Rs. 16,000/- (Post 2), Rs. 21,200/- (Post 9) as per organization norms. Closing Date of Offline Submission of Applications Is : 31-03-2017. Click Here For Haryana Seeds Development Corporation Limited Official Notification Link.